I'm having a little art show on November 9th. "Escaping Logik", New Artwork by Anthony Pugh. 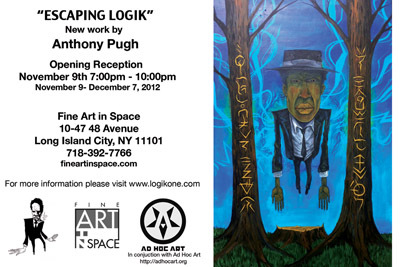 Escaping Logik is a solo exhibition presented at Fine Art in Space by Brooklyn-based artist, Anthony Pugh. The show opens with a reception on Friday, November 9th from 7:00 pm-10:00 pm. Anthony will be presenting acrylic painted works, as well as over 100 watercolor pieces. In conjunction with his new work, he is releasing a limited edition sketchbook entitled Escaping Logik. The works collected for the show encompass numerous themes such as Anthony’s personal commentary on social interpretations of historical figures, graffiti stories, and urban/rural mythology – he has secretly listened to a fictional conversation between Malcolm X and Robert Johnson. Anthony runs towards a creative vindication: shaping and developing a narrative about an evolving Negroid sentinel character, who is on the brink of breaking free from the contradictions of his environment and from the struggle to maintain his identity. The paintings depict the possibility of freedom from the barriers of social isolation and the constant flux between black & white. Logik was once an alias for the artist, but now it is a metaphor for an evolving personal mythology, which he resists but cannot deny. Escaping Logik is influenced by Anthony’s experience as a graffiti artist, his love of comic books, and his fine art education. Anthony Pugh is a freelance illustrator, comic book artist, and a dedicated painter. Some of his clients include: DDBO, Phoenix New Times, Mecca Clothing, Kid Robot, Spike DDB, Pepsi Cola, 11211 Magazine, Vessel Drinkware, City Pages, and The Village Voice.